Kottayam is one of the 14 districts in the state of Kerala, India. Bordered by Western Ghats on the east and the Vembanad Lake and paddy fields of Kuttanad on the west, Kottayam is a land of unique characteristics. Panoramic backwater stretches, lush paddy fields, highlands, hills and hillocks, extensive rubber plantations, places associated with many legends and a totally literate people have given Kottayam District the enviable title: The land of letters, legends, latex and lakes. Kottayam literally means the interior of a fort - Kotta + Akam. Rulers of Munjanad and Thekkumkur had their headquarters at Thazhathangadi near Kottayam town Marthanda Varma of Travancore attacked Thekkumkur and destroyed the palace and the Thaliyil Fort. The remnants of the palaces and forts are still seen here. The important rivers of the district are the Meenachil river, the Muvattupuzha river and the Manimala river. The river is formed by several streams originating from the Western Ghats in Idukki district. The important towns in the basin are Pala, Poonjar, Ettumanoor and Kottayam. Kottayam occupies a prominent place in the cultural map of Kerala. Kunchan Nambiar, the father of Thullal, a popular temple art form, was supposed to have lived at Kidangoor. Kottayam has a vast network of rivers, backwaters, ancient religious places, and hillstations. Vembanad Lake has a great expanse of water which is a part of the interconnected Kerala Backwaters that run virtually the length of the state. Kumarakom, located on the coast of Vembanad Lake, is a beautiful village stocked with divine mangroves and coconut groves, lush green paddy fields, gushing waters snaking through the dense forests. Kumarakom bird sanctuary, is home to migratory birds like the Siberian stork, egret, darter, heron and teal. Kottayam district is also known for its religions harmony and has numerous temples, churches and a 1500 year old mosque. Panachikad Temple, one of the famous Saraswathy temples in Kerala is located nearly 12 km away from Kottayam. The Siva temple at Thirunakkara is in the heart of Kottayam town. Thirunakkara Srikrishna temple, Pallipurathukavu Devi Temple are other important temples located in the town. Kodungoor Devi temple, Kavinpuram Devi Temple (Ezhacherry), Chirakadavu Mahadevar temple, Ponkunnam Devi temple, Cherubally Devi temple, Kidangoor Subramanyaswamy Temple and Vaikom Mahadevar temple are other famous Hindu temples near Kottayam. Kottayam has a rich culture. One of the oldest mosques in Kerala, Thazhathangady Mosque is situated in Kummanam at 3 kilometers from Kottayam town. This mosque is considered to be around 1500 years old and was built by early Arab travelers who landed in Kerala during the time of the Cheraman empire. Old Syrian Seminary, a prominent religious institution belonging to the Malankara Syrian Orthodox Church and a seminary for aspiring priests for Syrian Christians in Kerala, is also located in Chungam, Kottayam. The Cheria Pally, an ancient Church belonging to the Malankara Orthodox Church is a well preserved church with wall murals dating back to ancient times. St. George Church, Puthupally, and the Vakathanam Palli are two renowned and ancient churches frequented by pilgrims. Cherpunkal Church is a famous Church in the name of Infant Jesus. By Air The nearest airport from Kottayam is at Kochi. By Rail Kottayam is well connected by rail. Vennimala is a serene and beautiful place located in the Puthuppalli village panchayath of Kottayam district .Vennimala, a stone's thrown away from the bustling Kottayam Town is the serene and beautiful hill top destination, Vennimala is located nearly 15 km from the Kottayam town and can be assessed easily through the Kottayam- Kumili road. It is believed that Lord Rama and Lakshmana during their period of exile visited this hillside. At that time numerous sages meditated in the caves of Vennimala. Cheraman Perumal illustrated emperor of ancient Kerala consecrated this temple and stayed in this place. He was taken to the beauty of this place and stayed here and built a palace. He earmarked the hill as a sacred and protected place. Sadly, the palace doesn’t remain today. The temple celebrates twenty Eight days of annual festival every year. The place also was the residence of Tekkumkoor dynasty. The hill had more than sixty large and small ponds scattered throughout the forest. Even today about a dozen such ponds are remaining with sparkling fresh water even in hot summers. Vennimala is covered by lush green vegetation and rubber plantations.. Another major attraction here is a huge cave on one side of the hill, half a km from the temple. It is believed that this cave, runs for over a kilometer to the temple premises, though it has been closed by fallen rock. Matrumala is located in Kooropada village and is about 8 km from Vennimala. The place can be accessed from Kottayam through Pampadi. Matrumala is a hill top that offers stunning views of the entire surroundings.The place got its name as it has a small temple on its top dedicated to Goddess. The temple is believed to have been built by Parasurama, the legendary creator of Kerala who installed idols of the seven Goddesses (Saptamathas) here. A muddy winding road leads to the hill top that can be approached by either vehicle or on foot. This quaint little village is located about 20 km northwest of Kottayam town. The place can be easily accessed from Kottayam by road as well as rail.Kallara and the neighboring villages of Kaduthuruthy and Thalayolaparambu has unending stretches of lush green paddy fields crisscrossed by numerous canals that drain into the backwaters of Ezhumanturuth and fall into the mighty Vembanad lake. The waterways also connect Kallara with Vaikom in the north and to Kumarakom in the south. Scenic stretches in the village include Kapikkad, Mundar,Ayamkudi, Pulithuruth, Erunthuruth, Ponnuruk, Pazhampetti,kumparaand Karikkal. There are ancient temples and churches scattered in the village. The backwaters of Ezhumanthuruth have many attractive small islands in them.Very soon Kallara will be a model tourism village, where the tourists can experience the art and process of screw pine product development and other such rural products enjoying scenic vistas stay units in this village. Alapra is the only place in Kottayam district where padayani is performed. Padayani festival at Alapra is performed in Thacharickal Bhagavathi temple. Another unique features here is that the temple is located in serene surroundings and is in the middle of forest. The annual padayani performance in Alapra falls in the month of March / April. Alapra is scenic place with forests all around. There is 2500 acre forest called Ponthanpuzha Kutti vanam in the vicinity. This forest spreads over the districts of Kottayam and Pathanamthitta. The forest harbors deer, wild boar, fox, pythons, other small creatures and a variety of avifauna. There are nearly twenty small streams in the forest. The forest also has ancient Oottupara, a big rock inside the forest. The rock can be reached by trekking from the temple for three km. it is believed that Lord Rama visited this place and conducted a feast for saints at this place during his exile. The rock top offers stunning views for miles round. Behind this oottupara, there is a similar rock face also. River Manimala is an important water way of Central Travancore. Rising in the hills of Kottayam- Idukki ranges, the river flows through the midland plains and joins with Pampa and Manimala Junction. The river offers a beautiful view at this spot and flows swiftly striking against the many rocks in the river.Ramapuram:Ramapuram, a beautiful and quite village is located 15km from Pala town on the main road to Koothattukulam. Ramapuram has carved its own niche in the cultural history of Kerala. This small village was the birth place of Ramapurathu Warrier, the profounder of Vanchipattu. It was here where Lalithambika Anthrajanam the renowned Malayalam novelist lived. Ramapuram also is blessed with its old church and its famous missionaries-paramekkal Thoma Kathanar and Daivadasan Thevarparambil Kunjachan. Located on the banks of river Meenachil, Kudamaloor was the headquarters of the Chembakasseri Kings and was one among the sixty four villages of Kerala. The Valiyamadom Nalukettu stands in the locality where the old palace of the kings once stood. This residence is today inhabited by the royal family. The village has a number of old nalukettus and mansions that survive even to this day. A part of the remains of the fort of the kings still stands near Eraveeswaram Temple in the village. The holes where canons were fixed in the wall and the raised platforms can be seen even today in this fort wall. The Kings had a fleet of naval vessels - the chundan valloms which were anchored at Kottakadavu near the palace. Kudamaloor was a cradle of traditional Kerala art and architecture. The village has given birth to great Kathakali artists like Kudamaloor Karunakaran Nair. This hamlet still houses a number of artists well versed in Kerrida art forms and folklore. The village has performers of sopanasangeetham, Kalamezhuthu and pattu, mudiyattom, kalaripayattu etc. Devivilasam Kathakali yogam and Sopanam Kalavedi and research centre are two centers that promote Kathakali and other art forms. Moreover, Kudamaloor lies in Aymanam panchayath that was the theme village of Arundhathi Roy's 'God of Small Things'. The village is a land of temples - over ten in number. The Vasudevapuram Temple here has numerous mural paintings. Temples here are known for unique performances like tiyattu, Garudan parava and thookam. The religious harmony of this village is personified by the 800 year old St. Mary's church that was built by the Hindu King. The ritual offering here is a traditional water bag and rope used to draw water from the well. As you travel form Vaikom to Ernakulam by road you pass three bridges in succession. As you look out, you are greeted by lush green scenery on either side. It is the river Muvattupuzha and its numerous branches that drain into the Vembanad Lake at this spot creating picture post card scenery all round. And this village is called Ithipuzha. Here there is little tourism. There are few houseboats, no resorts and hence charming and serene waterways all round the village. The various distributaries of the river create numerous beautiful islands in its course. Here there are endless stretches of coconut palms and vast green paddy fields. You can relax yourself on a country canoe ride - floating on the gentle ripples of the rivers and watching the fishermen carrying their catch in small canoes. lthipuzha can easily be accessed from Kochi. Pallam is located 5km to the south of Kottayam town and is accessible via the Main Central Road. 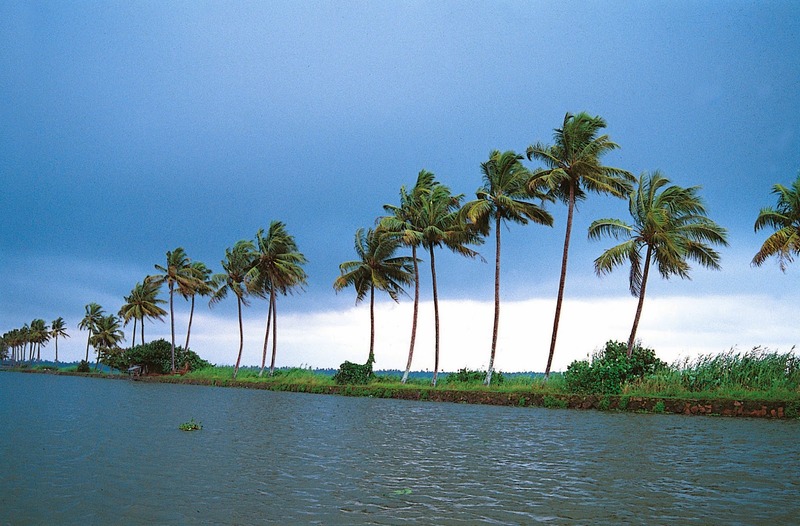 The setting is typical Kerala rural with quiet villages escorted by scenic backwaters and vivid green all along. Migratory birds come seeking this verdant landscape every summer and frolic in the natural splendors till the end of the season. A boat ride in this river Kodoorar to Kumarakom via Pallom backwaters is a great way to relax and enjoy nature's bounties. Another unique feature hem is the old light house put up at this site in 1813 A.D. by the British resident of Travancore, Col. Munroe. Considered as a wonder of architecture, the light house still stands intact facing the placid backwaters providing an excellent view of the lush green paddy fields and swaying coconut palm. Located amidst shady rubber plantations, streams tinkle as they make their way through the rugged landscape and roars down cascading from a height of hundred feet. This beautiful picnic spot is located at Pallickathodu 25 km from Kottayam town and hence easily accessible. This is one of the highest waterfalls in Kerala gushing down from a height of 235 feet. Aruvikachal is located in Poonjar Thekkekara village and can be accessed from Erattupetta. The waterfalls can be approached by walking a couple of kilometers from Patampuzha junction. Adivaram, Ummikunnu, Puliyallu, Muttanallu, Parayambalam etc. are some of the scenic spots scattered around Aruvikachal. The 3500 ft high Mutukoramala offers spectacular views. The Poonjar Palace is also noteworthy. This scenic stream and its breathtaking waterfalls are together referred to as the enchantress of the jungle. Sliding down numerous hillocks from a height of 200 ft, the gushing water has etched out over the years a twelve metre deep pond in the rocks and joins the Teekoy river way down. And right under the waterfalls is a natural bridge. Marmala waterfalls lie a few kilometers away from Erattupetta and it is exactly seven km from Teekoy rubber estate. From here a private vehicle can take you further two km after which the road is not motorable. To reach the falls one has to trek through the estate over the rocky path. Skirting the Kottayam district are beautiful valleys of Elaveezhalpoonchira, spread over thousands of acres in Melukavu village. The pristine beauty of nature is preserved almost intact here in the imposing mountain ranges with rocky cliffs. The verdant landscape is punctuated by five gigantic hills viz. Vindhyan medu, Hidumbanmedu Mankallumudi, Kolanimudi and Mukalanthumudi each rising to around 3200 ft. Elaveezhapoonchira means valley where leaves don't fall and is named so because the place has no trees. Perhaps this may be the only spot in Kerala from where one can see the beautiful phenomenon of sunrise and sunset in the same spot. The vast horizon gives a panoramic view of the surrounding five districts. During the monsoons when the valley fills up to form a scenic lake, this place unveils another beautiful slice of nature. The panoramic view of the Malankara dam just below the hill is an exquisite site for the visitors. The different elevations of the mountain ranges with contrasting shapes give this hill station a dramatic and distinctive outline of great scenic splendor. Just below the hill, there is a small perennial pond like water body called Elaveezhapoonchira. Three tribal settlements and four natural caves provide significance to this mystic land. The great Pandavas were said to have lived incognito in this land during their exile and hence these caves are called "Pandavart Guha!'. Another peculiar feature is the presence of two Muniyanas nearby the pond. Lusitrourt growth of medicinal plants gives another added attraction to this area. Another exotic feature is the Nilayara which is a cave located in Mukalanthanmudi, one kilometer from the Poonchira. The cave itself is a wonder as far as a tourist is concerned. About 20 people can stand at a time inside the cave. A small perennial stream is flowing from the inner mouth of the cave. As the name suggests, the valley of this rocky mountain reflects the morning sun with a mirror like perfection. This is also the highest point in Elaveezhapoonchira. Three km from here is the Pazhakakanam Plateau nourished by the Kadapuzha River. Bamboo groves, meadows and wild flowers make this place exotic. An added attraction here is the Kazhukankulimali Waterfalls that playfully cascade down the mountain and greet the river below with a magnificent splash. On the eastern side of Kannadipara is a natural fort set admidst steep rocks. Numerous mountain streams in this Peak, 6000 ft. above sea level, flow down to form the serene Meenachil River. The solitude, the tranquility, the gentle breeze and the star spangled sky here are all enchanting beyond words. Tourists have to trek up three km to reach the top of the hill. And if you so wish, you could even spend the night on the heights. Three hills, each rising to 4000 ft. and above, together form this huge hill. Each of the hills has a peculiar shape. One of them resemble a mushroom owing to which it gets its name Kuda Kallu (umbrella shaped rock). It is said that the medicinal herb Neela Koduveli, which bathes the hillsides in blue, grows here. This flower is also believed to possess supernatural powers which could increase wealth and ensure a rich harvest. The second hill has a small hunch on the sides and is therefore referred to as Koonu Kallu (hunch back rock) which is located 4000ft above sealevel. Across this rock is a 1/2 ft. wide bridge called Narakapalam (bridge to hell). From the hilltops, the Arabian Sea can be seen in the distant horizon as a thin blue line. The sunset on a full moon day is sensational, when the moon can be seen rising up like another sun, as the orange sun goes down. It is an enchanting landscape formed by a chain of green hills at the Bharananganam panchayat on way to Erattupetta and Ayyampara. A shrine dedicated to the Pandava brothers of the epic Mahabharatha is found here in six acres. There is also a temple of Lord Sankara Narayana. As in the famous temple at Sabarimala, only ghee is used to light the lamps here. Women are not permitted inside the temple. Kayyur hill and Tevaka. hill was the wandering place of legendary â€˜Kulapurathu Bhiman'. Another major picnic spot in the region is Nadukani. The hill has a vast rocky terrain with grasslands. As the name signifies one can see the entire surroundings from this hilltop. The winding road from Teekoy to Vagamon offers mind boggling scenic vistas. Vagamon located on the fringes of Kottayam District is an upcoming hill station. On the way to Vagamon is the beautiful spot called Kottathavalam.The Pandya king of Madurai and his family camped at this location on his way to Poonjar. The place was surrounded by hills on three sides like a fort and hence this place got its name Kottathavalam. Kottathavalam has huge caves which remains still unexplored as well as a ten acre reserve forest without wild beasts.The rocks carved in the cave like chairs and couches and figures of Gods sculpted on them are all worth exploring. The Kurathikallu, Karantakakallu and Kattil para nearby are other major attractions. Nearby Kottathavalam are Vazhikkadvau and the famous Kurishumala Asram. On the outskirts of the district is Vazhikkadavu, a land of rocky terrains sought after for its pristine nature. On one side of the main rock are extremely tall and steep rocks and on the other is a valley of fearful depth. Bordering this crude landscape like a silver lace is the Meenachil River. Three km from Vazhikkadavu is this renowned Christian pilgrim centre where hundreds of devotees from far and near converge during the holy week and after, to climb the hill in faith, carrying small wooden crosses. The peaceful Monastery at the top of the hill, the silence of the hills, the cool mountain air and the lush green landscape are all soothing to the soul. On the eastern side of the hill is Muruganmala housing a rock cut temple dedicated to Murugan (son of Lord Shiva). The mausoleum of Sheikh Fariduddin at Thangalppara makes this place a famous Muslim pilgrim centre also. This quaint hamlet situated in the Western Ghats is located 5km north of Mundakkayam in Kottayam District. The majesty of the mountain ranges combined with the beauty of the forest and the artificial lake created by the check-dam of the Manimala River makes the spot linger in your mind. Amruthameda, famous for medicinal plants is nearby. Kootickal is located only 12km from the pilgrim centre of Erumeli. Situated seven km from the Mundakkayam - Kuttikanam stretch on the K.K. Road lies Panchalimedu, at an altitude of 2500 ft above sea level. A three hour trek from Valliankavu which is connected by bus from Kottayam takes you to the spot. Valliankavu, a tiny village 10km East of Mundakkayam itself is worth a visit for it is the site of the famous temple of Mala Araya community. According to the legends, the Pandavas stayed here and the pond beside a small temple is where Panchali is said to have bathed.